Because my husband is also gluten free and my 16 year old daughter has noticed she doesn’t feel very well after eating bread, I’ve been on the hunt for fast, easy, family friendly recipes for our weeknights. They need to fill us up and not include bread. I also have two sons, a 15 and 10 year old to feed. The two easiest types of dishes so far have been Mexican and Mediterranean. I could live off Mexican food. Last night’s meal was Mexican and it was delicious. We also had a very busy night planned of picking up my daughter’s car (EEK I have a driver- prayers and positive thoughts please) and eating at a new yogurt shop (that we never found – please don’t get me started). I needed to be able to throw dinner together pronto! Here you go. An easy, fast, delicious, gluten-free, crowd pleasing dish. 2. Heat skillet with a little butter (or oil if you don't like to use butter). Add chicken tenderloins. Salt and pepper one side and cook for 2 to 3 minutes. Turn. Salt and pepper other side. Cook for another 2 to 3 minutes. Cook until no longer pink inside, fork goes through easily and chicken has a nice brown color on outside. Set aside and let cool while rice is still cooking. 3. Heat black beans on stove or in microwave. Set aside. 4. Slice chicken after it's cooled. 5. Fill bowl with rice. 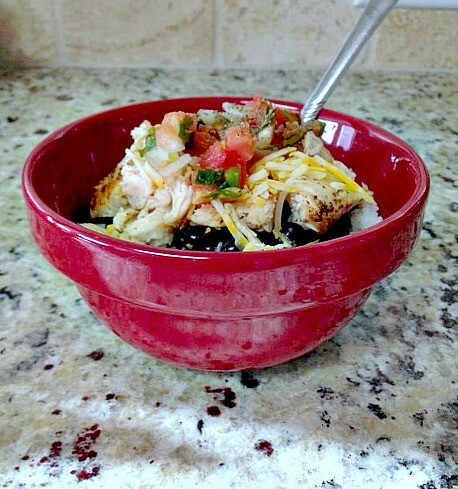 Layer with beans, chicken, cheese, pico de gallo, sour cream and salt & pepper to taste. 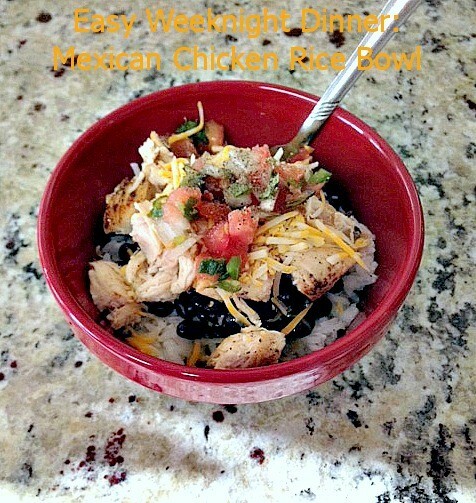 For picky eaters you can just do rice, chicken and cheese. Melt the cheese a little on top of the chicken and flavor a little with salt & pepper if they like. I also served strawberries with this. It was a huge hit! As for our yogurt shop debacle…we ended up getting Frappes somewhere. All was well. Do you have a favorite family friendly weeknight meal? I would absolutely love some ideas? Please share in the comments below!